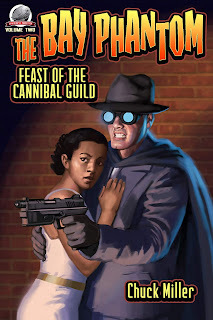 When a shadowy group of criminals start shaking down restaurants in Mobile, Joe Perrone once again dons the cloak and goggles of the Bay Phantom. Shortly thereafter, wealthy young men begin dropping dead without warning. What do these things have in common with a mysterious psychic, a sinister funeral home, and a nationalist movement known as the Transatlantic Patriots Guild? That is what the Bay Phantom must learn, and he must do it without his trusted aide, Mirabelle Darcy. She is away on a mission of her own; one that necessitates her breaking into the Leavenworth Federal Penitentiary. Thus left to his own devices, can the Phantom thwart the Cannibal Guild and their deadly assassin, the Mummifier? Or will he become their next victim? Once again Chuck Miller offers up a thrilling new adventure set in the Deep South and starring his original pulp hero; The Bay Phantom. This is pulp action with an added spicy kick. Along for the adventure are cover artist Adam Shaw and, debuting for the first time with Airship 27, interior illustrator, Kevin Paul Shaw Broden. Available from Amazon and soon on Kindle. Why do people cheat, rob and murder? Why are people tempted to commit dark deeds? These are the questions that have always plagued the great detective, Sherlock Holmes. 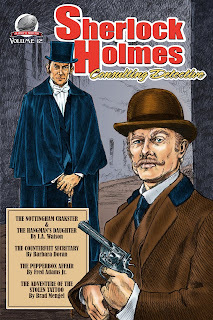 In this, the 12th Volume of the best selling series, Consulting Detective, he and his faithful companion, Dr. Watson take on five new cases that will challenge their intellect and lead them through the twisted minds of nefarious souls. From chasing after a notorious confidence man to solving the death of a twin; a stolen tattoo or a murder of a bride before her wedding day, writers I.A. 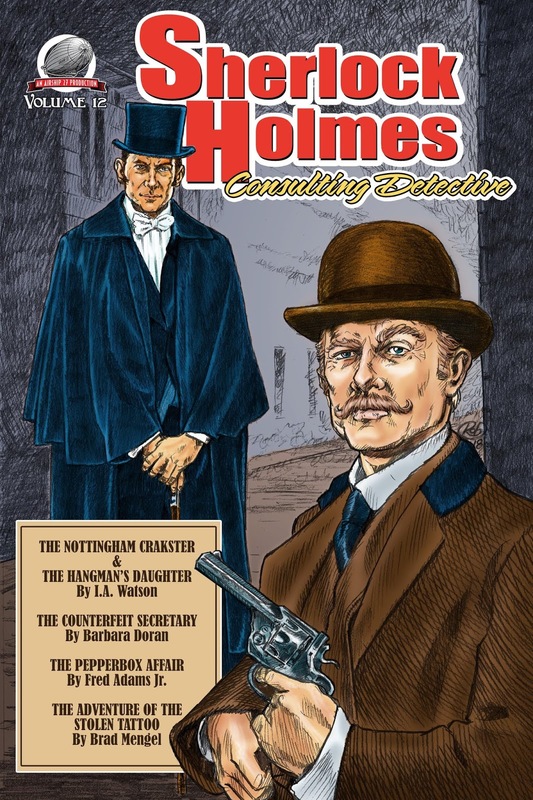 Waston, Barbara Doran, Fred Adams Jr. and Brad Mengel have produced truly remarkable mysteries guaranteed to keep Holmes and Watson fans up late night. As ever, the game is afoot!! Available now from Amazon in paperback and on Kindle.